Seanergy Maritime Holdings Corp. announced yesterday (Nov 14) that it has successfully concluded the refinancing of the 2011-built Capesize M/V Championship through a leasing agreement with Cargill International SA (Cargill). The refinancing has released approximately $7.8 million of liquidity for the Company. Pursuant to the agreement, the Company has chartered back the Vessel on a bareboat basis and subsequently entered it into a five-year time charter with Cargill at a rate which is linked to the 5-routes Time Charter average of the Baltic Exchange Capesize Index (BCI). The Charterer will also cover 100% of the equipment and installation cost for retrofitting the Vessel with an exhaust gas cleaning system (a scrubber). Stamatis Tsantanis, the Company’s Chairman & Chief Executive Officer, stated: “I am very pleased to announce another landmark transaction for our Company, and at the same time we are delighted to welcome Cargill to our shareholding structure, marking the commencement of a strategic partnership. Cargill has been historically one of the major charterers of our Capesize fleet. “The vessel refinancing allows us to enhance our liquidity position while drastically reducing the underlying interest cost. Furthermore, the capital investment for the scrubber installation, which will be assumed by the Charterer, is increasing the market value of the Vessel and reflects positively on our NAV. The implied financing amount of the Championship is $23.5 million, including $1.6 million in restricted cash, releasing approximately $7.8 million of gross liquidity. The implied interest cost of the transaction is equivalent to approximately 4.65% all-in, fixed for five years. Based on the expected weighted average life of the transaction, the equivalent margin at current swap rates would be LIBOR + 1.50%, compared to LIBOR + 4.65% under the previous financing arrangements. The leasing agreement does not include any financial covenants or value maintenance provisions. 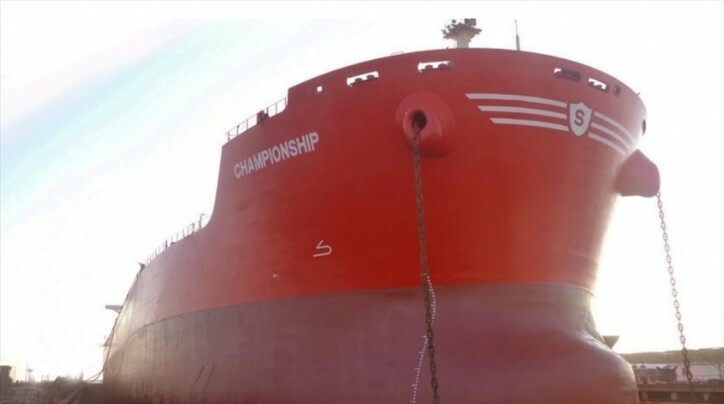 Moreover, the Company has continuous options to buy back the vessel during the whole five-year leasing period, at the end of which it has a purchase obligation at $13.5 million. Under the terms of the time-charter party, the Vessel will earn an index-linked rate based on the 5-routes Time Charter average of the Baltic Exchange Capesize Index (BCI). At any time during the charter, the Company will have the option of receiving a fixed daily charter hire for a certain period, based on the prevailing market level of the forward freight agreement of the BCI. The firm term of the time-charter matches the firm term of the leasing transaction that is a period of 60 months, with an additional period of 18 months at charterer’s option. As part of the time-charter, the charterer will also cover 100% of the equipment and installation cost for retrofitting the Vessel with a scrubber. On top of the daily hire, the Company will receive an additional compensation based on the spread between the price of High-Sulphur Fuel Oil and the price of Marine Gas Oil or other IMO-compliant and ISO certified Low-Sulphur Fuel Oil throughout the term of the time charter. Scrubber technology is an efficient method of removing both sulphur and particulates from air emissions thereby protecting human health and reducing acid rain. Research studies from government organizations and independent companies conclude that scrubbers are safe and compliant with international regulations concerning ocean acidity and biodiversity.